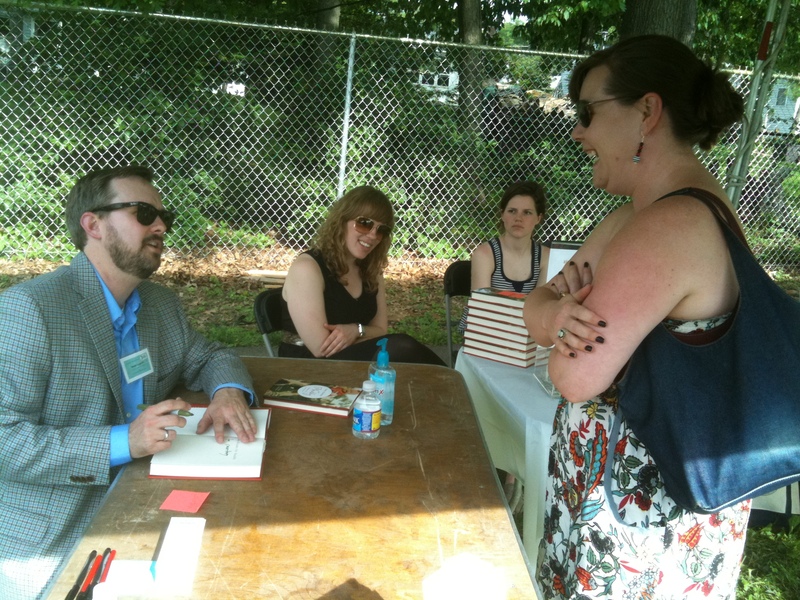 This past weekend I went to the Gaithersburg Book Festival in — you guessed it, Gaithersburg. Now my love of books and reading isn’t something that I am ashamed of, embarrassed by or even shy to talk about. I love to read. seriously. However, my trip to this book festival was really because I would get the chance to have the author of a book that I bought (pre-sale) sign it AND I would be able to say “hello” to this said author. To give a short and sweet history on this book and author — I have been following a blog for almost three years now. I was forwarded the link by a friend at work with the disclaimer that it was based on a sad story (it truly is a heart-breaking story that has been been turning into the biggest happy face ever) but was encouraged to go to this site when needing a quick break from the daily ho-hum in the office. After one viewing, I was hooked. As a faithful blog follower (creep, stranger, friend) I began to feel that I knew not only Matt, but his adorable wee girl Maddy (go to the site to learn more about them, you won’t be sorry). Reading weekly (at some points daily) updates about his life and the happenings gave me a sense of “familiarity’ and a sense of ‘knowing’ that person. He wrote a book (two kisses for maddy) — I bought the book — he is on a book tour — he was going to be in gaithersburg — I put it on my calendar — I made plans to go and get a signature and hear his keynote speaker speech (which was great) — I went to the event — I got in line (first in line I might add!) — his speech was over — he sat at the table — it was my turn to go up — I turned into a mute. After years of reading and updating on his blog — the moment to say “Hey Matt – I think you, Maddy and Brooke are awesome” was finally there and all I could do was cross my arms (not sure where or why the hell THAT happened) smile, giggle and feel totally an utterly like an idiot. I was utterly tongue-tied. Thank heavens the BF was there to take a photo of the event to prove it happened. I can only imagine the embarrassment I would cause myself if the chance to interact with Dave Matthews (or anyone in the band really).